Everyone is allowed to speak freely about anything on the Web, but this should always come with responsibility. 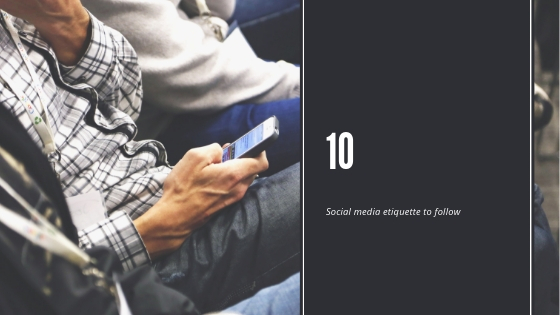 As with any dealings in public spaces, social media etiquette must be observed. 2018’s word of the year is “toxic” and that says a lot about our environment right now. Don’t add to all the negativity you see around. Also, stop tagging celebrities and other people in hateful tweets and comments. If you don’t like what you see online, there’s a mute button on Instagram and Twitter and an unfollow button on Facebook. It’s almost 2019. Stop using terms like “gay,” “fat,” “maitim,” or “tibo” as derogatory terms. These aren’t and shouldn’t be insults. “Always cite your sources” are words you always heard in school, but ‘di lang ‘to para sa thesis. Give credit where credit is due whenever you post something whether it’s a quote, saying, photos, or art. If you don’t know who the original poster is, put it in the caption. Say “Just grabbed this from the Web,” or “Author/artist unknown.” Don’t try to pass off others’ words and works as your own. Chat messages are private since they’re between you and your friend or a group. If you want to share your conversations to your timeline for others to see, ask permission from the other people in the chat. If ever the screenshot includes usernames or full names of people, blur them out. Not blurring them out allows strangers to search the people in the conversation. Also don’t share any private info of your friends to the public like their phone numbers and addresses. Nothing comes for free even though we’d love to receive without having to pay for it. Art like music, movies, and games sometimes come with a price because their artists work so hard and spend so much to hone their craft. Although it’s easier and cheaper to pirate content, you should support art by buying it or downloading it from legal sites. So you just got home from a trip out of town and you’ve taken hundreds of photos that you want to share to your Facebook friends. Before you flood their timelines with your fun times, know that there is such a thing as oversharing on social media. We’re not saying that you shouldn’t post your pictures; we’re saying you should curate them. Pick the best photos or if you want to post them all, label the album as photo dump or keep the privacy to only you. Of course when the newest episode of your favorite series is out or when the movie you’ve been waiting for forever is finally showing in the cinemas, you’ll want to let your friends know that you are watching. Just remember one very important thing: don’t ever post spoilers. Don’t spoil the fun for others by tweeting about who died or what happened in the end. Let them experience the show or film the way you did. Try to have the time to reply. People appreciate it if you reply to their messages. Your social media can be overwhelming with messages at times, but try to make time. Reply to urgent messages when you can, and if the messages are a couple of days old already, offer an apology regarding your late reply. Some of your social media friends aren’t as tech-savvy or media-literate as you are, like your lola or lolo who uses Facebook to check on your relatives or your little sibling who watches a lot of YouTube. Likewise, more and more people are scrolling through Facebook for their daily dose of the news. Try your best to not share fake news because there are websites out there that look like and copy the names of media outlets but are filled with fake stories. Help out your relatives and friends by telling them to avoid those sites and just follow official ones. In a group photo, the first thing many people ask after taking the shot is “Maayos ba mukha ko diyan?”Then it’s usually followed by the statement, “Tag mo ako ah.” As you’re skimming through your photos looking for the one to post, you’ll want the one where you look best, that’s understandable. Before you hit tag and post on Facebook, ask everyone in the photo if they’ll be fine with you tagging them, and make sure that they look decent in the photo as well. They’ll appreciate that. You wouldn’t want your friends tagging you in photos where you don’t look your best, right? On Instagram, people love using filters (Clarendon, to be exact), but on other social platforms, it’s a rarity. Some people on Facebook and Twitter could use a filter, and we don’t mean the image effects kind. Although we are granted the freedom of speech, we should and must take responsibility for what we say. It doesn’t take much to offend someone in society today, so as active social media users, we should really think before we click that post button.